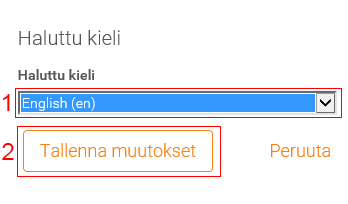 When you log into Moodle for the first time, you may have Finnish as the default language. First, log in to Moodle. Your name is on the top of the page. (BTW, Kirjaudu ulos = Log out). 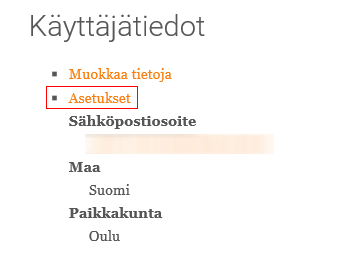 Now look for Käyttäjätiedot (=User details) and choose the link “Asetukset” (Settings). 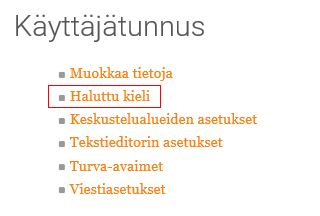 Below the Käyttäjätunnus (=user name) header, click the “Haluttu kieli” link; it means preferred language. This is the final step: Choose English from the drop down menu and click the “Tallenna muutokset” button and you are done. This article was published in these categories: English version available, Oamk , GUIDELINE, Bulletins & Guidelines, for students, learning environmentsand tagged Moodle Snap theme, Moodle, Moodle ohjeita opiskelijoille.Add a permalink to your favourites. Follow comments to this post with a RSS feed. Post a comment or leave a trackback: Trackback URL.